Note that some other functionality still exists, like being able to increment the number via the scroll wheel on a mouse. Yes, where margin:0 is, you should be able to just style the element from there. I am looking to find the documentation on this element. I want to turn the spinners on in mobile. Can we stop modifying values when we keep mouse cursor on focused element and scroll mouse wheel ? If yes, please provide solution. DON’T blur it, just prevent the event. loosing focus on mousewheel is a bas experience. Why would you blur the input? How annoying for the user. Just prevent the event firing. how do the same in reverse order: -webkit-textfield-decoration-container set to read-only but buttons set to enabled ? Did u find any solution to this? How to prevent using angular JS? Let me know if any? Is there a solution for firefox 29? But this defeats the purpose of limiting input to numbers lol. Thanks for the FF 29 solution. Ahhh nice! Thanks for the fix in FF 29 @Stephan! That’s perfect! nice indeed stephan. thanks man! Is there a way to have number inputs with and without spinners? I’m trying to tag certain inputs with a class name. Add the ‘input-number–noSpinners’ classname to the inputs you want without spinners. Is “Numeric Spinner” the best name for this? This does NOT work on Opera Mobile, it insists in showing the annoying spinner buttons. It’s annoying that you’re considering Opera Mobile at all. Love Bruno’s suggestion, but I wanted this to apply to all number input elements by default, so I modified it slightly. With the below code, the mousewheel gets disabled automatically (for number inputs) without any extra html! 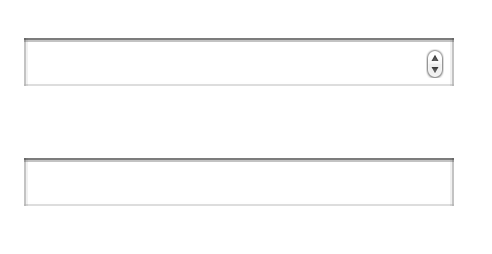 Any input fields with a step of 0 will not get spinners, the rest will. One more thing, can’t we style those spinners? Like having a bigger height and width? i used padding to make it bigger. @Bruno and Jacob: Thanks for the suggestion. I also want to disable the up and down keys for the same. How can I do that? -webkit-appearance is not reconized …. this ‘ -moz-appearance: textfield;’ is ok but I lose control specific type number…. and ::-webkit-inner-spin-button does’t exist in choice for css …. The original posted code does not work in FireFox. It works in Chrome and Opera. FireFox shows the spinners but do not adjust them to a specified box height. C and O do. Have not tested this in Windows 9+. Why work around it and waste time on it? Just wait until FireFox catches up. Rather expose / show the imperfection of a certain browser at any time than try fixing it. They all catch up on their imperfections pretty quick these days. December 18 2014. It does not work on firefox. Any ideas about that? What if you want to show always the increment not on hover? I believe you are referring to chrome behavior? I would also like to make the spinners always visible but have not found a way. Any pointer to how I assign this to a specific number id=”mynumberfield” would be super! or else please refer this link—- http://exisweb.net/css-input-number-firefox —–it might be helpful………..
its working but i dnot want to enter any text in the field. then what can i do.this is not perfect solution. Note that the text says this snippet is for WebKit browsers. Firefox would require a different solution.